Practice with the bokken (wooden sword), jo (wooden staff) and tanto (knife) is a unique and important part of our Aikido curriculum. 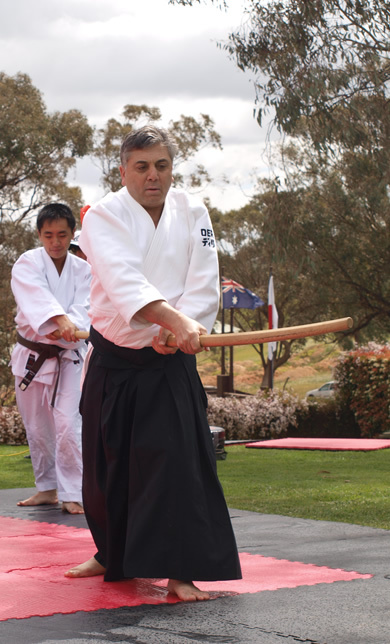 This practice reflects the use of weapons as a way of uncovering the deeper meanings of Aikido principles as taught by O’Sensei in the Iwama dojo. It was this integration of weapon and body practice into a combined Aikido system (riai) that was taught directly by O’Sensei only to Saito Sensei, at the Iwama Dojo. It was only at Iwama that O’Sensei allowed weapon practice to be conducted. For this reason, Saito Sensei became the inheritor of the weapons training that was developed by O’Sensei and taught at Iwama. This practice of the bokken and jo, Saito Sensei codified and maintained at Iwama. Only students who attended practice there were able to learn it. To understand the combined Aikido system is to realize that one is not dependent upon a ken, jo or other weapon. Development of mind, body and technique does not rely upon armoury, but on independence of action. If a sword is used do not realize it as a sword. If a jo, do not depend on it, but feel the common harmony of movement. 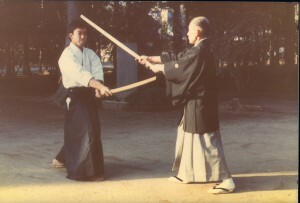 Training with weapons emphasises both the posture of hito e mi (the back triangle stance) and awase (harmony of movement). 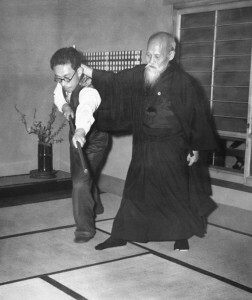 It is the incorporation of these two concepts that makes Aikido unique. This unified practice of ken, jo and body is the practice of the Iwama Dojo passed on by O’Sensei. Derek Minus, who trained with Saito Sensei, as an uchi-deshi (live-in student) at the Iwama dojo in 1980, holds the four weapon transmission schools. He is qualified to instruct Aiki-ken (sword) and Aiki-jo (staff) and continues this practice at special Sunday training sessions each week.